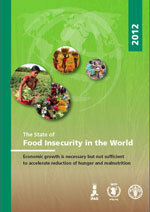 The 2012 edition of The State of Food Insecurity in the World presents new estimates of undernourishment based on a revised and improved methodology. The new estimates show that progress in reducing hunger during the past 20 years has been better than previously believed, and that, given renewed efforts, it may be possible to reach the MDG hunger target at the global level by 2015. However, the number of people suffering from chronic undernourishment is still unacceptably high, and eradication of hunger remains a major global challenge.2012 presents new estimates of undernourishment based on a revised and improved methodology. The new estimates show that progress in reducing hunger during the past 20 years has been better than previously believed, and that, given renewed efforts, it may be possible to reach the MDG hunger target at the global level by 2015. However, the number of people suffering from chronic undernourishment is still unacceptably high, and eradication of hunger remains a major global challenge. This year’s report also discusses the role of economic growth in reducing undernourishment. Economic growth is most effective in reducing poverty and hunger when it increases employment and income-earning opportunities that the poor can take advantage of. Sustainable agricultural growth is often effective in reaching the poor because most of the poor and hungry live in rural areas and depend on agriculture for a significant part of their livelihoods. However, growth will not necessarily result in better nutrition for all. Policies and programmes that will ensure “nutrition-sensitive” growth include supporting increased dietary diversity, improving access to safe drinking water, sanitation and health services and educating consumers regarding adequate nutrition and child care practices. Economic growth takes time to reach the poor, and may not reach the poorest of the poor. Therefore, social protection is crucial for eliminating hunger as rapidly as possible. Furthermore, when properly structured, social protection also promotes economic growth by building human capital and helping farmers manage risk so that they can adopt improved technologies. Finally, rapid progress in reducing hunger requires government action to provide key public goods and services within a governance system based on transparency, participation, accountability, rule of law and human rights. The designations employed and the presentation of material in this information product do not imply the expression of any opinion whatsoever on the part of the Food and Agriculture Organization of the United Nations (FAO), the International Fund for Agricultural Development (IFAD) or of the World Food Programme (WFP) concerning the legal or development status of any country, territory, city or area or of its authorities, or concerning the delimitation of its frontiers or boundaries. The mention of specific companies or products of manufacturers, whether or not these have been patented, does not imply that these have been endorsed or recommended by FAO, IFAD or WFP in preference to others of a similar nature that are not mentioned. The designations employed and the presentation of material in the maps do not imply the expression of any opinion whatsoever on the part of FAO, IFAD or WFP concerning the legal or constitutional status of any country, territory or sea area, or concerning the delimitation of frontiers. All rights reserved. FAO encourages the reproduction and dissemination of material in this information product. Non-commercial uses will be authorized free of charge, upon request. Reproduction for resale or other commercial purposes, including educational purposes, may incur fees. Applications for permission to reproduce or disseminate FAO copyright materials, and all queries concerning rights and licences, should be addressed by e-mail to copyright@fao.org or to the Chief, Publishing Policy and Support Branch, Office of Knowledge Exchange, Research and Extension, FAO, Viale delle Terme di Caracalla, 00153 Rome, Italy.